It has been my privilege to know and paint the Countess de Hoernle for Palm Beach State College. News of her death over the weekend, just came to me, and brought back the wonderful, but bittersweet, memories of our adventure together. The Countess would meet me in the library of her building for our portrait sittings. She always came – charging down the hallways on her motorized cart. So funny, and charismatic! Apologizing to others in her building for monopolizing the library. We would laugh, and enjoy each other’s company. Her soul shines from the oil portrait. Elegance as well as old world charm and a feisty spirit was my goal. When I painted her, I took into account the large atrium that the paint would be hanging, as well as the colors of this large lobby area. Working around that, we decided on a lovely green dress to be worn, and a complementary background in a peachy color. The oil portrait took 5 months to paint. 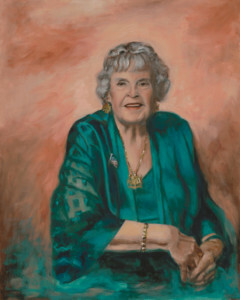 A Grand High Tea was held at PBSC Boca Raton to unveil her portrait. Palm Beach County and Boca Raton Society came out in all their splendor to honor this special woman. The Countess de Hoernle was the Grand Honoree of my first Portrait of a Woman, 2012. We will all sadly miss this lovely woman, a Philanthropist who gave from her heart to children, education, and charities of her home Boca Raton Florida. At 103 she passed away leaving a beautiful legacy.